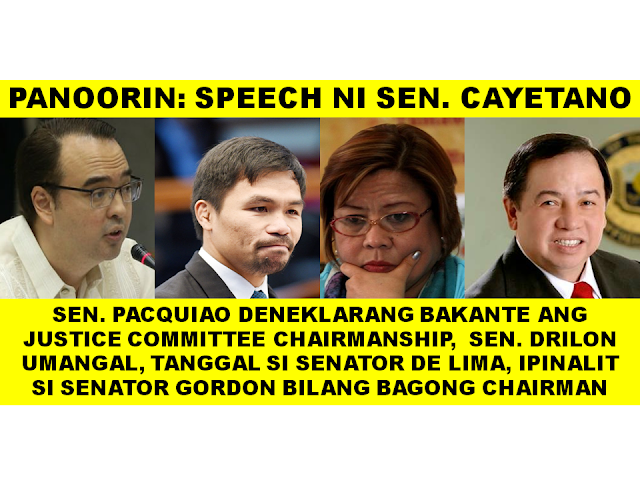 THOUGHTSKOTO Thoughtskoto : WATCH: CAYETANO SPEECH, PACQUAIO MOVED TO DECLARE JUSTICE CHAIRMANSHIP VACANT, DE LIMA OUT, GORDON IN! WATCH: CAYETANO SPEECH, PACQUAIO MOVED TO DECLARE JUSTICE CHAIRMANSHIP VACANT, DE LIMA OUT, GORDON IN! WATCH SENATOR DE LIMA'S REACTION AFTER HER OUSTER AS JUSTICE COMMITTEE CHAIR.